Interstate 64 (I-64) is an Interstate Highway in the Eastern United States. Its western terminus is at I-70, U.S. Route 40 (US 40), and US 61 in Wentzville, Missouri. Its eastern terminus is at an interchange with I-264 and I-664 at Bowers Hill in Chesapeake, Virginia. I-64 connects the major metropolitan areas of St. Louis, Louisville and Lexington in Kentucky, Charleston, West Virginia, and Richmond and Hampton Roads in Virginia. At 953.74 miles, I-64 is the second longest interstate highway not ending with a 5 or 0, after I-94. I-64 overlaps with I-55, I-57, I-75, I-77, I-81, and I-95. I-64 does not maintain exit number continuity for any of the overlaps, as each of the six north-south routes maintain their exit numbering on their respective overlaps with I-64. In Missouri, the stretch was originally labeled as the Daniel Boone Expressway then only as US-40, and as such, is still known to some locals in the St. Louis area as Highway 40, even though the road has been designated as both I-64 and US-40 since 1988. This road is also the southernmost portion of the Avenue of the Saints. An interchange at Highway N O'Fallon, Missouri opened on December 13, 2004. This interchange also accommodates the tie-in of the Missouri Route 364 freeway to I-64. In April 2007, construction started to rebuild 10.5 miles (16.9 km) of I-64 in St. Louis, Missouri, from Spoede Road to Kingshighway. This project included repaving the entire road, rebuilding the overpasses and interchanges, adding a fourth lane between Spoede Road and I-170, and connecting I-64 to I-170 in all directions. Construction resulted in the complete closure of portions of the expressway in 2008 and 2009. In 2008, I-64 was closed from I-270 to I-170, re-opening December 15, 2008. Beginning December 15, 2008, I-64 from I-170 to Kingshighway was closed. On December 6, 2009, with a grand opening ceremony and dedication, Interstate 64 was completed in its entire length in Missouri from the Poplar Street Bridge to I-70 in Wentzville.As of December 7, 2009, I-64 is now complete and signed all the way to Interstate 70 in Wentzville. All stoplights have been removed. The portion of Interstate 64 in St. Louis has been named the Jack Buck Memorial Highway, in honor of the late sportscaster. I-64 enters Illinois from St. Louis, Missouri, via the Poplar Street Bridge, where it overlaps I-55 as it crosses the Mississippi River. After crossing the city of East St. Louis and the rest of suburban St. Clair County, the freeway heads southeast through rural Southern Illinois. Shortly after passing Mid-America Airport at Exit 23, I-64 enters Clinton County, then Washington County. After providing access to towns such as Carlyle, Breese, Nashville, and Centralia, the freeway overlaps I-57 through the Mt. Vernon area for approximately five miles. East of Mt. Vernon in Illinois, services along I-64 are few. The freeway crosses Jefferson, Wayne, and White counties as it progresses east toward Indiana and the Evansville area. East of the St Louis area, there are numerous oil wells dotting the landscape. The section from IL 127 to I-57 opened on October 4, 1974. The section from IL 161 to IL 127 opened in December 1973. The section in the Metro East, except for a short section near I-55/70, opened on December 23, 1975. The section from US 460 (later IL 142) to US 45 opened on August 7, 1975. I-64 crosses the Wabash River and enters the state of Indiana. It passes Griffin (exit 4/State Road 69) and Poseyville (exit 12/State Road 165), and also passes under nearby State Road 68 (no direct interchange serves State Road 68, though one can access said route from either State Road 165 or 65) then passes three officially marked exits for Evansville (State Road 65, US 41, and Interstate 69) then proceeds through part of the scenic Hoosier National Forest, with exits leading to Dale and Huntingburg (Exits 57A-B/US 231), Santa Claus and Ferdinand (exit 63/State Road 162), French Lick and Tell City (exit 79/State Road 37), and Indiana's first state capital, Corydon (exit 105/State Road 135). Near milepost 61, there is a time change from Central Time Zone (Spencer County) to Eastern Time Zone (Dubois County). As with all time zone changes on highways maintained by the Indiana Department of Transportation, this change in time zone is not marked with any roadside signage. Between Evansville and New Albany, I-64 intersects a few major north-south arterial highways, such as U.S. 231, Indiana 37, Indiana 135 and offers access to Interstate 65 to Indianapolis via Interstate 265 before crossing into Kentucky on the Sherman Minton Bridge. The 123-mile route in Indiana can be described as being somewhat winding, especially the farther east one travels within the state. The longest straight line distance along the route is the around 9 mile stretch from the Indiana 65 exit to the 26 mile marker, 1 mile east of U.S. 41. There are many points along the route where the two halves of the highway are nearly 500 feet apart, especially around the Hoosier National Forest and points to the east. In addition, there are several points, especially in the very sharp valleys along its route in Dubois, Perry, Crawford and Harrison Counties, where the highway towers more than 100 feet above the surrounding terrain. Streaking lights on I-64 as seen from the horse/bike bridge at Seneca Park in Louisville, Kentucky. Interstate 64 enters Kentucky at Louisville, paralleling the Ohio River along the Riverfront Expressway. It intersects with several downtown interchanges before coming to the Kennedy Interchange, where it intersects Interstate 65 and Interstate 71 in a tangle of ramps often referred to as the "Spaghetti Junction". Moving eastward, I-64 passes through Shelbyville, Frankfort, Midway, Lexington, Winchester, Mount Sterling, Owingsville, and Morehead, before leaving the state near Ashland at Catlettsburg. It overlaps Interstate 75 as it makes an arc around the northeast of Lexington's urban core, with the exit numbers for I-75 used for the concurrent portion. The two interstates separate a few miles east of downtown Lexington. Interstate 64 travels for 184 miles (296 km) within the state of West Virginia, passing by the major cities of Huntington, Beckley, and Lewisburg, and directly through the Capital city of Charleston. It has only two major junctions within the state: Interstate 77 in Charleston and in Beckley. It also crosses the Kanawha River a total of four times in a 20-mile (32 km) stretch (twice west of Charleston, immediately before entering the downtown Charleston area, then approximately 5 miles (8.0 km) east of downtown Charleston in Kanawha City). Between I-64's two junctions with I-77, I-64 and I-77 overlap. 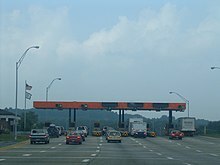 From the final crossing of the Kanawha River east of Charleston to their split at Exit 40 south of Beckley, the two Interstates are tolled, forming a part of the West Virginia Turnpike. While the two expressways overlap, the exit signs are those for Interstate 77. Thus, eastbound travelers entering from Kentucky will see exit numbers increase until Exit 60, at which time Interstate 77's exit numbers are used, decreasing from Exit 100. Interstate 64 in Virginia runs east–west through central Virginia from West Virginia via Covington, Lexington, Staunton, and Charlottesville to Richmond. From Lexington to Staunton, it overlaps Interstate 81 (using I-81 exit numbers). In Richmond, it overlaps Interstate 95. From Richmond, Interstate 64 continues southeasterly through Newport News and Hampton to the Hampton Roads Bridge-Tunnel, and then through Norfolk and a small portion of Virginia Beach to end in Chesapeake. I-64 itself does not reach the Oceanfront area of Virginia Beach, as it continues through the western portion of Virginia Beach as part of the circumferential Hampton Roads Beltway. At its terminus, East I-64 is actually running westbound (and West I-64 eastbound), as the route forms a fishhook around Norfolk. Interstate 264 intersects the beltway, providing access to other parts of Norfolk and Chesapeake, and extending east to the Oceanfront. Access to the Oceanfront area is accomplished from I-64 via a portion of Interstate 264, a roadway originally built as the Virginia Beach Expressway, funded by tolls to retire revenue bonds. Elements of Interstate 64, such as the Sherman Minton bridge over the Ohio on the Indiana-Kentucky border, were completed by the early 1960s. The interstate was complete between St. Louis and Charleston with the completion of the 9th Street overpass in Louisville in December 1976. In Virginia, the proposed southern route between Clifton Forge and Richmond called for the Interstate to follow from Richmond via US-360 and US-460, via Lynchburg to Roanoke and US-220 from Roanoke to Clifton Forge, then west following US-60 into West Virginia. The initial 1957 recommendation by a state-retained engineering consultant was for the northern route, but due in large part to the efforts of a Virginia Senator Mosby G. Perrow, Jr. from Lynchburg, the state changed the location to the southern route in 1959. Despite assurances from the federal government that the route would be decided by the state, Virginia's 1959 decision was overturned in favor of the northern route through Charlottesville. I-64 had a proposed routing around the US 50 corridor in Illinois when the interstates were first planned. Local pressure pushed the routing closer to the US 460 corridor because of the cheaper cost and shorter mileage compared to the original routing, but not before construction was started on a short section that is now US-50 between Vincennes, Indiana and Lawrenceville, Illinois. It is also worth noting that the apparent route of I-64 would have taken it through the southern end of Carlyle Lake which was also under construction at this time. I-64 signs started going up in August 1987 on the US 40 freeway in St. Louis. This change was made in part due to truck drivers deliberately using US 40 to avoid mandatory fines for overweight trucks. On September 9, 2011, the Sherman Minton Bridge was closed down by Indiana governor Mitch Daniels after construction crews found cracks in the main load bearing structural element. Mainline traffic was redirected to Interstate 265, then south on Interstate 65 across the John F. Kennedy Memorial Bridge before rejoining Interstate 64 at the Kennedy Interchange in Louisville. Repairs were completed in a few months later and the Sherman Minton Bridge reopened at 11:50 pm on February 17, 2012. I‑70 / US 40 / US 61 in Wentzville. I-64/US 40 travels concurrently to East St. Louis, Illinois. I-64/US 61 travels concurrently to the Frontenac–Ladue city line. I‑44 / I‑55 in St. Louis. I-55/I-64 travels concurrently to East, St. Louis, Illinois. I‑255 / US 50 in Caseyville. I-64/US 50 travels concurrently to O'Fallon. I‑57 in Mount Vernon. The highways travel concurrently to south-southwest of Mount Vernon. US 150 west of New Albany. The highways travel concurrently to Louisville, Kentucky. I‑75 in Lexington. The highways travel concurrently through Lexington. US 52 in Kenova. The highways travel concurrently to Huntington. US 119 in Charleston. The highways travel concurrently through Charleston. I‑77 in Charleston. The highways travel concurrently to southeast of Crab Orchard. US 60 east-southeast of White Sulphur Springs. The highways travel concurrently to Callaghan, Virginia. US 60 / US 220 in Mallow. I-64/US 60 travels concurrently to north-northwest of Lexington. I-64/US 220 travels concurrently to east-northeast of Clifton Forge. I‑81 east of East Lexington. The highways travel concurrently to Jolivue. I‑95 in Richmond. The highways travel concurrently through Richmond. I‑464 / US 17 in Chesapeake. I-64/US 17 travels concurrently through Chesapeake. I-44/55/64/70 on one highway sign in downtown St. Louis. I-164 - Former spur to Evansville, Indiana, known as the Robert D. Orr Highway, became I-69 in 2014. ^ a b DeLorme Street Atlas USA software. Toggle Measure Tool and Driving Directions for Missouri Mileage. ^ a b "FHWA Route Log and Finder List: Table 1". Federal Highway Administration. Retrieved October 4, 2014. ^ "The Grand Opening of The I-64 Project" (PDF). MoDOT. ^ "The New I-64". MoDOT. Retrieved January 30, 2007. ^ Schlinkmann, Mark (October 14, 2009). "Last traffic light on Hwy. 40 removed". St. Louis Post-Dispatch. Retrieved November 5, 2009. ^ a b "Virginia Interstate Exits: Interstate 64". Richmond: Virginia Department of Transportation. March 29, 2018. Retrieved March 29, 2018. ^ "Sherman Minton bridge shut down; crack found in bridge". Louisville, KY: WDRB. September 9, 2011. Retrieved September 9, 2011. ^ "Sherman Minton Bridge closed indefinitely due to structural cracks". The Courier-Journal. Louisville, KY. September 9, 2011. Archived from the original on January 10, 2013. Retrieved September 11, 2011. ^ Barrouquere, Brett; Cappiello, Janet (September 12, 2011). "Traffic nightmare over closed Ohio River bridge". Associated Press. Retrieved September 12, 2011. 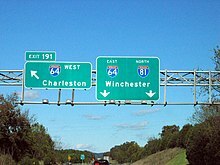 Wikimedia Commons has media related to Interstate 64.